Make a statement with this handmade textured tag featuring origami Christmas tree, satin ribbon, real Queen-Ann's-Lace flower and glittery accents. Has decorative to/from panel on the back for gift giving. 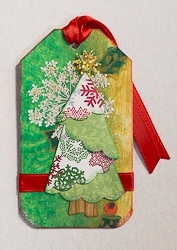 Use as a gift tag, favor tag, tree ornament or envelope decoration. Tag is 2 1/4" wide by 4" high. Note: Available in quantity of one.